Rant the Sixth – Accidents Happen – Who said that? Yes they do. Particularly ones of the vehicular type, and this is usually the result (doesn’t look much at all does it? but enough to actually render the car undriveable. Anyhoo)…. Almost a week and a half ago now the Other Half had an accident in my car. Not a problem, as he was OK and it’s a damn sight easier to fix a bit of plastic and metal than flesh and bone, (as you’d like to think, although I’m beginning to wonder) and there is this delightful thing called Car Insurance which is supposed to be there to help you out. So I called them, within an hour of the accident, to explain what had happened and via a mutual discussion over Google Street View (an insurance god send) of the ‘incident’ location and a description of where the damage to my car was, they came up with a ‘not at fault’ answer. You’d like to think that meant great, and you wouldn’t have to worry about getting the car back that you desperately need because you drive 2,000 miles a month *just* to get to and from work! THINK Again!! Here’s the timescale thus far….. Hire car company finally drop off car. Admittedly because I was determined not to ruin the break away I was supposed to be leaving on two hours after the accident initially happened and wasn’t going to miss regardless of cost to me. I also received e-mail correspondence requesting statements, drawings, & photographs of the road. Nationwide Crash Repair collect my car for an “estimate” on damage repair costs. I’m promised at the time that I will contacted to inform me that my car has been received at the repair centre. This *never* happens. “going up on the ramps to check for further structural damage” which is fine, thorough checks are good think I. At the same time I e-mail PDF versions of all hand written documents with regard to the accident to the insurance company. NO CALL received regarding status of car. Finally receive call from Nationwide Crash Repair detailing some (not all) of the repairs due to my car. All of which are straight forward and simple. The bumper needs a new plastic wrap, I need a new wing, wheel & suspension strut, the bonnet needs a repair. It’s all simple and straightforward. Even I know that as a semi-enthused car enthusiast. I love my car, and when things need fixing I know what’s what. Erm…. Ex-squeeze me, the what, what?! It’s taken you thus far SEVEN days to work out what it needs. You’re now telling me it’s going to take you ELEVEN days to put it right?! NATIONWIDE CAR REPAIRS YOU ARE TAKING THE PISS! It’s no wonder the costs of car insurance claims are going through the roof! I have to have a hire car as I am currently driving over 150 miles a day. The longer you drag this out, the longer I have an over inflated car hire charge to claim back. I know several amateur rally teams whose service guys would have done this yesterday. Would you like their phone numbers? I am posting on behalf of Nationwide Crash Repairs and would like to explain why things have taken so long thus far. Firstly, we (Nationwide Crash Repairs) are unable to carry out any work, including estimates to a vehicle, until we have received authorisation from the customers insurance company, as they are paying for the costs involved in carrying out the estimates and then the repairs. In this case, as soon as we received authorisation from your insurance company we carried out an estimate and the very same day sent it back for further authorisation (Thursday 27th March). Further authorisation was required in order to carry out more in-depth investigations into the damage. We received further authorisation on Monday 31st, carried out the investigations and sent an additional estimate back to your insurance company on the same day. We have now received authorisation for all the repairs and have contacted you to inform you as such. We have ordered the parts required but unfortunately some of these are on back order as the suppliers do not have them in stock. I am sure you can appreciate, the supply and delivery of parts is unfortunately out of our control. It is in our interest to try and ensure all vehicles are repaired and returned to our customers as soon as possible and I can assure you we do our very best to prevent repairs taking any longer than necessary. In your case, your insurance company held matters up and now we are waiting for parts. I can understand your frustration and acknowledge that we could have kept you better informed, however, we are not responsible for the delays you have experienced. As regards the lack of communication, I have contacted the Cheltenham centre and requested they keep you better informed of the progress of your repairs. You should have been contacted, especially if we had promised to do so, and for this lack of communication I would like to apologise. Thank you for your response. I appreciate you taking the time out to read and reply to this post. However. The “Tough luck it’s not our fault we’re at the mercy of pen pushers and other people’s shoddy logistics” reply really isn’t satisfactory. Neither is the phone call I received today telling me that “SOME parts MAY arrive on the 15th, we’ll call you next Tuesday with an update.” Which means at least a further week’s delay in getting my car back. I’m beginning to think I owe your company training plan some compliments, as everyone I’ve dealt with so far seems highly competent in both vagueness & obfuscation. I believe you may have slightly misunderstood my response and would like to assure you of our attention to the issues you have raised. We take all feedback, especially critical feedback, very seriously. If we were responsible for any of the delays you had experienced so far, I would have no hesitation in acknowledging as such. However, these delays were initially caused by your insurance company and we are now waiting for parts, both of which are beyond our control. These are simply the facts and I am not trying to evade responsibility. I do not believe it is your “tough luck” and certainly did not intend to give you the impression that that is our attitude. It is not and I am sorry that you have this view. Your vehicle requires parts which are currently not in stock with our suppliers. They have informed us when we are likely to receive these parts, however, experience has told us that we possibly may not receive them until a later date. Rather than tell you on 14th April that we have not received the parts and your car is not ready, we have pre-warned you that there may be an issue with delayed parts. We are simply trying to keep you as fully informed as possible so as to avoid further disappointment at a later date. I fully understand how frustrating the repair process is, especially when it is not as straightforward as you had hoped. 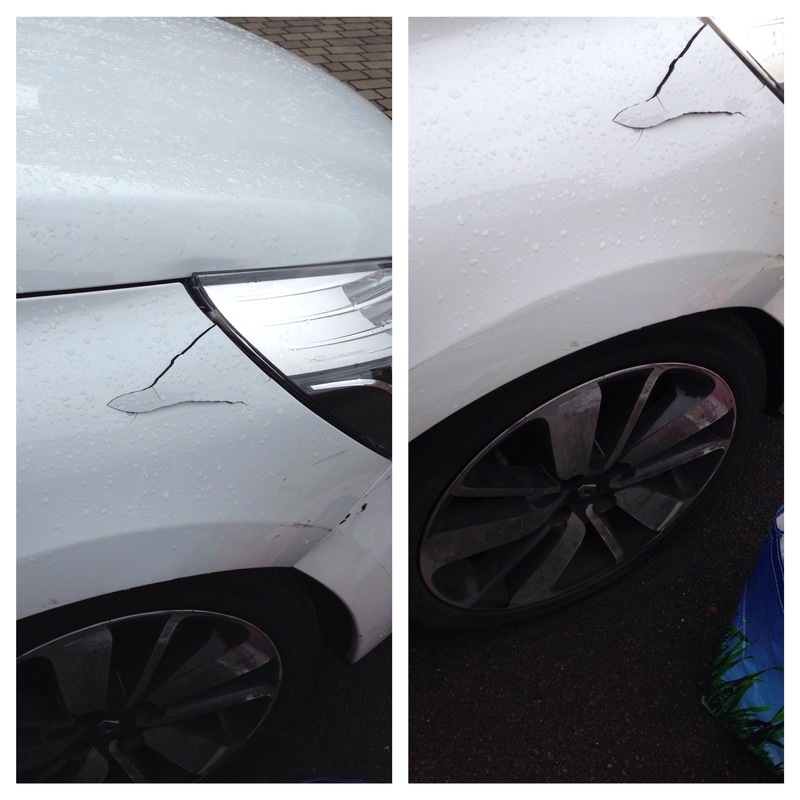 I can only try and reassure you that we are doing our very best to complete your repair as soon as possible, without compromising on the quality.